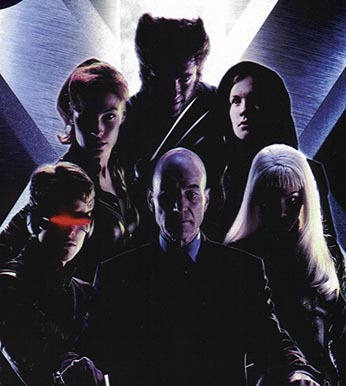 This movie mostly serves as an introduction to the world of the X-Men, making known the main characters and their powers and outlining the ideas of genetic discrimination both against 'mutants' and against normal humans. Mainly, the film focuses on two characters; Marie aka Rogue and Logan aka Wolverine. Marie is a frightened teenage runaway whose mutant power is the ability to drain the personality, energy and memories of others via skin on skin contact. However she is unable to control her power and thus cannot afford to touch anyone. same metal housed in his forearm, he is practically a living weapon. The two meet in Canada when Marie stows away in Logan's trailer. They soon come in contact with the X-Men and learn of the struggle between them, led by their mentor Professor Charles Xavier, and Erik Lehnsherr aka Magneto who leads the Brotherhood, a group of mutants who believe in mutant supremacy. The film is barely over an hour and a half, and the movie is so quickly paced that the time passes quickly. The movie does revolve around Logan and Marie and while you do get some insight into the personalities of the other characters, it is slightly annoying to see them passed over. The beginnings of a love triangle is shown between Logan, Jean Grey and Scott Summers. Ororo Munroe, however, is barely touched upon apart from a brief confrontation with Logan. Basically the X-Men is a different twist on the theme of racism and prejuidice, mixing super powers, costumes and heroics with discrimination and hatred.